Facilities where the cemetery population originated had various names. The timeline of operation for these healthcare facilities dates back to the 1800's. 1877 - The County purchased the Poor Farm to house indigents. Jean Brunet (the founder of Chippewa Falls) was the first resident. 1892 - Federal legislation was enacted mandating states to provide care for their chronically insane and mentally retarded residents. 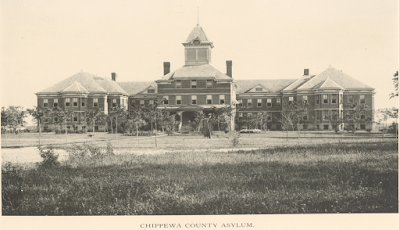 1894 - The Chippewa County Board decided to build an insane asylum. 1895 - The main building was erected on a 240 acre farm. The first patient was received December 26, 1895. The number of patients in 1912 was about 75. 1902 - The County Home was erected to replace the Poor Farm. 1930 - Due to the increased number of indigents an additional home was built to house 60. 1945 - The Chippewa County Insane Asylum & County Home had capacity for 435. 1945-1955 - The name was changed to the Chippewa County Hosp. and County Home. 1967 - Chippewa County Board decided to build a nursing home. 1971 - Patients were first admitted and the capacity was 193 beds. 1974 - County Board voted to build a new 160 bed facility to replace the old County Hospital. The new building was called Wissota Lakeside. 1976 - Residents from The County Hospital were transferred when project was completed. August 1, 1901 Row 1, Grave 1. September 26, 1965, Row 7 Grave 5. The marker is located at the cemetery behind the S.P.O.T.S. House, located at 2815 County Highway I, Chippewa Falls, Wisconsin 54729. The County of Chippewa, through its local legislative body, decided in 1894 to build a county asylum and in 1895 the main building was erected, and other improvements on a farm of 240 acres were made. The farm located 2 miles east of the city is on the banks of the Chippewa River and overlooks beautiful country across the river from the home for the Feeble Minded. The first patient was received December 26, 1895 and the number of patients in 1912 was around 75. The marker is No. 50 is a series of historical markers erected by the Chippewa County Historical Society. See also, Chippewa County Poor Farm Cemetery 2009 Dedication, also at this location. Photo used with generous permission of Chippewa County Historical Society. The headstones are flat . . .
. . . and are spaced evenly throughout the cemetery. These are twins, who died in infancy. The marker is located in Chippewa Falls, Wisconsin.